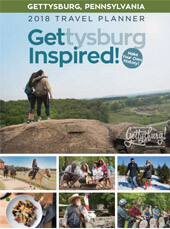 Gettysburg, Pennsylvania is widely known for its Civil War history, but the area is full of so many rich and diverse experiences. The Adams County countryside is a thriving agricultural landscape — home to countless family-owned farms and many roadside farm markets. These countryside markets not only make the area’s fresh, seasonal produce accessible, they also provide authentic experiences that give visitors a glimpse at farm life. What better way to begin your weekend than with a cheesy pizza pie shared with friends and family in historic Gettysburg, Pennsylvania? Gettysburg is quickly becoming known as a culinary destination – and whether you like a fancier pie, or something more traditional, we have you covered! Here are our recommendations for the best places for Friday night pizza!